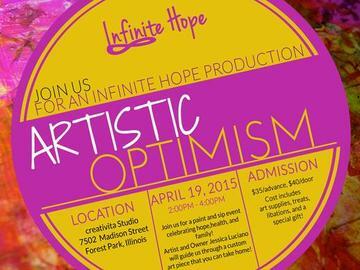 Join us for a paint and sip event celebrating hope, health, and family! Artist and Owner Jessica Luciano will guide us through a custom art piece that you can take home! Proceeds from this event go towards the Townsend Family Growth Fund! Come out and have a great time, while helping us become parents! Can't make it, but would still like to donate? You are welcome to visit our Gofundme page, or make a purchase in our Infinite Hope Shop! All ages are welcome! We do suggest that children be at least 5+ to ensure they have an enjoyable time. While Creativita provides aprons, it is highly recommended that you wear clothes that you wouldn’t mind getting paint on. You must be 21+ to consume any beverages during our party. Beverages will be provided, but participants are welcome to bring along their favorite beverages as well.